Heat a large skillet to medium high heat, add olive oil and ground turkey. Saute until turkey is no longer pink, approximately 6-8 minutes. 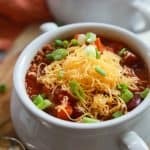 In a crock pot, add ground turkey, red onion, red pepper, green pepper, carrots, chipotle pepper, ground cumin, chili powder, smoked paprika, dry cilantro, garlic powder, ground cinnamon, diced tomatoes, tomato sauce, and water. Stir to mix. Next add in dark & ligh kidney beans, stir and cook an additional 30 minutes.